Tobii Pro eye trackers such as the Pro Spectrum, Pro TX300, Pro X2-30, Pro X2-60, Pro X3-120 can be used in different types study setups, not just attached to a computer monitor which is the most common situation. For example, the eye trackers can be used to record gaze data relative to a physical scene, a TV screen, mobile device stand, or a projection screen. In order for the eye tracker to map the gaze data correctly, the user must measure a few parameters related to the geometry of the eye tracker and mapping plane (i.e. your screen, TV or object), and provide that information to the eye tracker. The configuration can be done in different ways depending on the software you will use to present and record the data. Use the table below to choose which application to use to configure your eye tracker. Click the Tools menu and select Settings. In the Global Settings dialog box, click the Eye Tracker tab, select the eye tracker from the list and click the X Config Tool... button.The configuration window opens. Measure and enter the different parameters, relevant to your setup in the respective fields and following the graphic instructions. Click on "Save to Eye Tracker" to send the configuration to the eye tracker. Recommended: click on "Save to File", to be able to save an .xcfg file locally on your computer, to later access and change the configuration if necessary. When you have finished with your configuration close the configuration window. Test your configuration by performing a calibration and verification test. All parameters are measured in relation to a reference point on the eye tracker hardware. The reference point varies depending on which eye tracker model you are using. Please see the User's Manual for your eye tracker for details. Units — Select the unit you want to use for measuring the distances: inches or centimeters. Active Display Size — The correct display or stimuli size must always be added in the configuration tool. The Active Display Area is represented by the area on which the calibration is performed. For monitors, TV screens and other displays, measure the size of the visible active area on the screen where you can see the actual image. For projected displays, measure the size of the visible projection on the display. In a setup where the stimuli are filmed by a scene camera, the active display area must be calculated based on the calibration grid size used. Eye tracker angle — Use a digital angle gauge or similar tool to measure the agle of the eye tracker. In many setups the angle is commonly around 25 degrees. Display angle — Measure the angle between the vertical plane and the active display using the digital angle meter. In a scene camera setup measure the angle between the vertical plane and the calibration grid. If the display is tilted forward you should enter a negative angle (use “-” in front of the value). If the active display is completely vertical the angle value is 0. In a scene camera setup where you want to track objects on a horizontal table the angle would be 90 degrees. Height difference — Measure the height difference between the measuring point on the eye tracker and the bottom of the active display area. If the active display is located below the measuring point on the eye tracker (for example, in a projector setup) the value will be negative. Enter the value in the X Configuration Tool with a “-” in front to signify it as a negative value. Distance — Measure the distance from the measuring point on the eye tracker to the front of the active display on the monitor, projection screen, or TV screen, or in a scene camera setup to the virtual screen. If the measuring point on the eye tracker is located behind the active display, enter a negative distance (use “-” in front of the value). Use Side Offset— If the Eye Tracker is not placed right in front of the screen with the axis horizontally aligned, enter the side offset value, measured from the center of the active display to the center of the eye tracker. Enter a negative value if the eye tracker is located to the left of the center as seen from the front. Use Rotation — If the eye tracker is not placed parallel with the display or tracked object enter the value of the angle between the back of the eye tracker and the active display. If the eye tracker is rotated clockwise, enter a negative value. You must measure and specify all the parameters as accurately as possible to maintain good eye tracking data quality. The Eye Tracker Browser is an aplication that allows you to setup different parameters of the eye tracker, update the eye tracker firmware and troubleshoot the connection and performance. If available, plug in the USB memory stick provided with your eye tracker and run the Tobii Eye Tracker Browser installer on your Windows computer. Otherwise download the application from the web (link: Windows). Open the Eye Tracker Browser (Start > Programs > Tobii > Tobii Eye Tracker Browser). When the Eye Tracker Browser opens, a list of the discovered eye trackers is displayed. Select your Tobii Pro eye tracker from the list and click the Config Tool... button. The configuration window opens. Test your configuration by performing a calibration and verification with your stimulus presentation software. The Pro Eye Tracker Manager has a similar functionality as the Eye Tracker Browser, with aditional features, such as the possibility of performing a calibration and evaluating the results. Open the Pro Eye Tracker Manager application (Start > Apps > Tobii > Tobii Eye Tracker Manager). When the application opens, a list of the discovered eye trackers is displayed. Click on the eye tracker you want to configure. On the eye tracker panel, find the Physical Eye Tracker Setup section, then click on the "Preset" dropdown list and select "Create New Preset". A configuration window will open. Measure the height, width and tilt angle of your display area and enter the values in the respective fields then click next. In this new step you will measure the tilt angle of the eye tracker, the distance to the display, and the height difference between the eye tracker and the display. Click next when you have entered all the values in the respective fields. Name your preset and click on "Finish" to save it and to send it to the eye tarcker. If you had already created a preset and want to modify it, go to step 3, and instead of selecting "Create New Preset", select the preset you wish to modify, then click on the cogwheel icon located on the right of the "Preset" list. Display area — The correct display or stimuli size must always be added in the X Configuration Tool. The Active Display Area is represented by the area on which the calibration is performed. For monitors, TV screens and other displays, measure the size of the visible active area on the screen where you can see the actual image. For projected displays, measure the size of the visible projection on the display. In a setup where the stimuli are filmed by a scene camera, the active display area must be calculated based on the calibration grid size used. 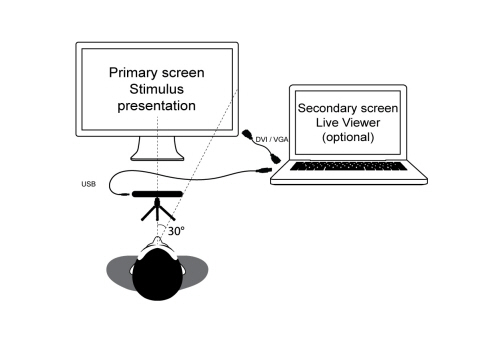 Learn how to best position the participant and the eye tracker in a study involving a screen based eye tracker from Tobii Pro.